This is an offering of a private room in an elegant boutique stay, located at a short distance of 1.1 km from Mall Road. The room on offer can accommodate up to three people and is ideal for a weekend getaway. The property features an in-house restaurant and an in-house bar for convenience. The room forms part of a well-developed establishment with ample parking space within the compound itself. 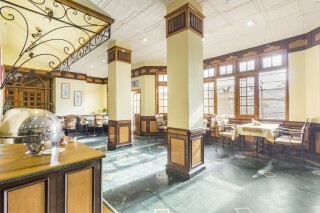 The boutique stay is tastefully decorated with partial woodwork and ornate décor. The sitting area is furnished with a comfy seater and exhibits a cosy vibe. 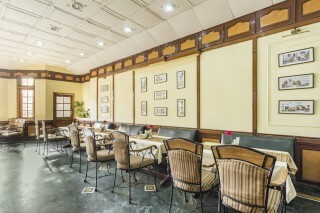 The in-house restaurant is spacious and has ample seating arrangement which lets you enjoy a good meal without any hassle. 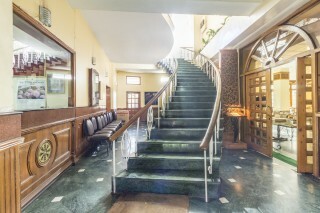 It is well-lit and features partial wood-panelled walls with a marble flooring. 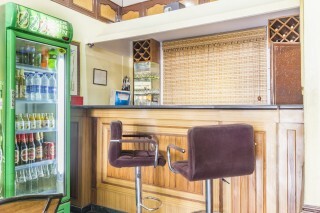 The in-house bar makes it convenient for the guests to drab a drink after an eventful day of exploring the hill station. The room on offer boasts partial wood-panelled walls and laminated wood flooring. 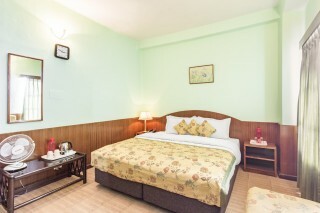 It is furnished with a cosy double bed with bedside tables and reading lamps for convenience. Ample windows ensure sufficient daylight and adequate ventilation. A wall-mounted mirror ensures that all your vanity needs are taken care of. It is additionally furnished with a dressing table, a two-seater, and a utility table for added convenience. A wall-mounted TV ensures that you do not miss out on your favourite shows. The en suite bathroom is well-appointed with western sanitary ware. 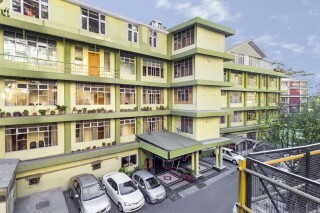 A guest house located less than a kilometre away from Mall road in Shimla. This place has all modern facilities and the best part about this place is that it is conveniently located right next to the city. Ideal for family holidays, the rooms are spacious and well maintained with attached bathrooms. 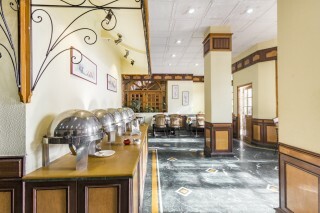 The in house restaurant offers a wide range of cuisines which include Indian, Continental and Chinese. Overall, a great place to stay and worth checking into.